UP Police Recruitment for 32000+ Posts annually. It is a good news for all eligible and willing graduates and 12th pass to get jobs in the police. 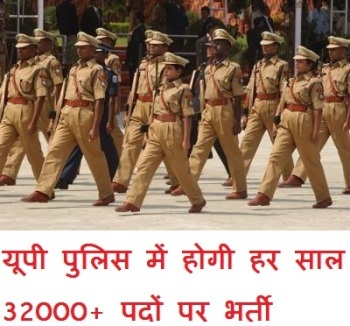 It is a good news for all eligible and willing graduates and 12th pass to get jobs in the police, that in order to fill all the vacancies of Inspectors and Constables with the approval of the Supreme Court in Uttar Pradesh, the Yogi Government will recruit 32,000+ posts in the next four years and this recruitment will go on every year for the next four years. You will be delighted to know that Yogi Sarkar has also released an upcoming program or road map for recruitment in UP police. According to the UP government, the recruitment process for the total 11376 posts of Sub Inspector will be started in the next year i.e. in January 2018, which will be completed by January, 2023. Similarly, the constables will be recruited every year from August 2017 and till September, 2021, a total of 101619 constables will be recruited. Every year 3200 Sub Inspectors will also be recruited. To bring uniformity in this whole process of recruitment drive in UP Police, with the introduction of recruitment process every year; the Chairman of the Police Recruitment Board will continue to hold the post till the final results are out. Even if there is any lackness or shortcoming found in the recruitment process, then the Principal Secretariat Home will be individually responsible for this. It is a golden opportunity for the 12th pass/ graduate candidates who wish to get jobs as Sub Inspectors and Constables in UP Police and they should not let this opportunity loose by their hands. It is advisable to the candidates that all the new updates in this regard are available in our Web Portal. Send your application for the said jobs in time so that you can start your dignified career in the UP Police as soon as an opportunity arises. We wish you all the best for your bright future in UP Police. Next Article Indian Navy Jobs, 10th Pass are eligible to apply for Sailor for MR (Musician) Feb 2017 Batch.